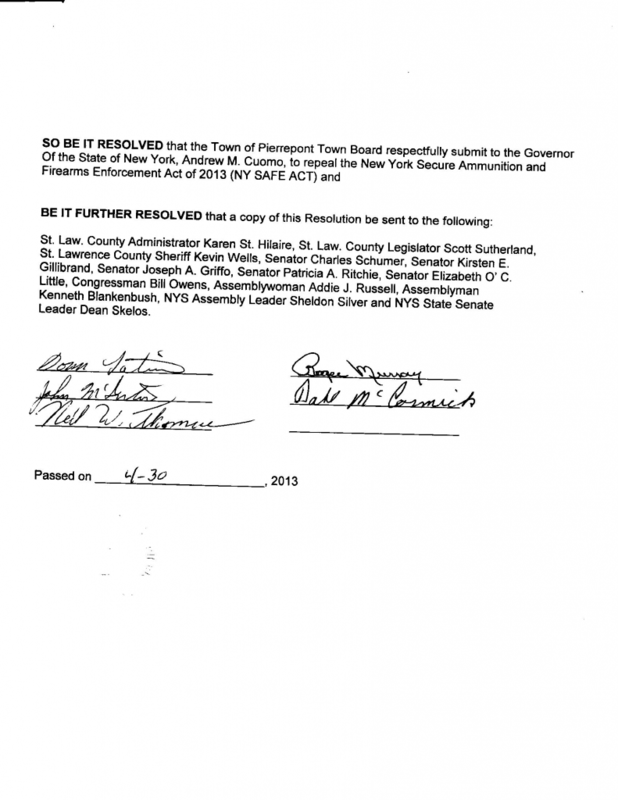 The Pierrepont town board voted unanimously to pass a resolution opposing the SAFE Act. Town Supervisor Thomas E. Latimer said he has been approached by numerous citizens asking the town to oppose Gov. Andrew M. Cuomo’s gun control legislation. “We’ve been asked to pass a resolution opposing the SAFE Act,” he said. The resolution was passed prior to a planned presentation from Will Gray, a local gun rights activist who has been traveling to town and village board meetings and encouraging municipalities to pass resolutions opposing the bill. While Mr. Gray said he’s not sure if the law will actually be overturned, he did say the more opposition it receives the better. “The more towns and villages we can get on board, the better off we’ll be,” he said, adding that to the best of his knowledge, St. Lawrence County, Lisbon, Colton, Norwood, Brasher and now Pierrepont have all passed such resolutions. The town of Parishville is drafting one that they are expected to pass at their next meeting.